What are blondies? Not many people here in Hong Kong have heard of them, but simply put, it’s a bar version of a chocolate chip cookie; call it the opposite of brownies, if you will. 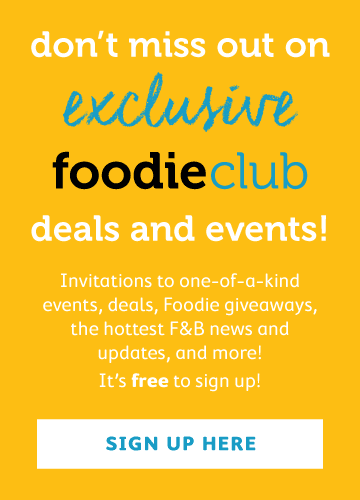 I first came across blondies when I was scouring food blogs for recipes. Originating from the United States, this confection has many variations, including white chocolate blondies, which include the addition of melted white chocolate, and congo bars, which often have walnuts mixed in the batter. I baked my first blondies a couple years ago, and due to their simplicity, they have become one of my go-to desserts ever since. This particular recipe has a distinct brown sugar flavour, and brown butter is also used in the mixture; it adds a hint of nuttiness to the bars, which elevates their flavour so that they're not just purely sweet, something I know many Asians aren't fond of. 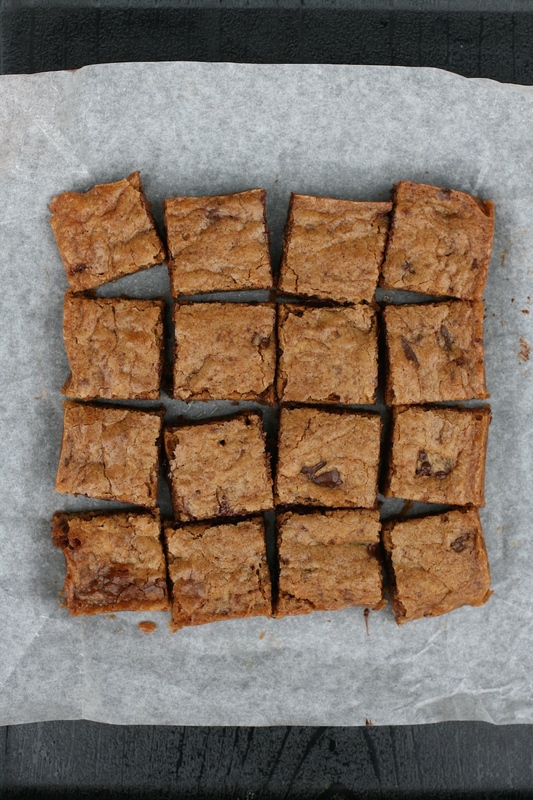 These blondies are chewy and fudgy at the same time, echoing the texture of brownies. 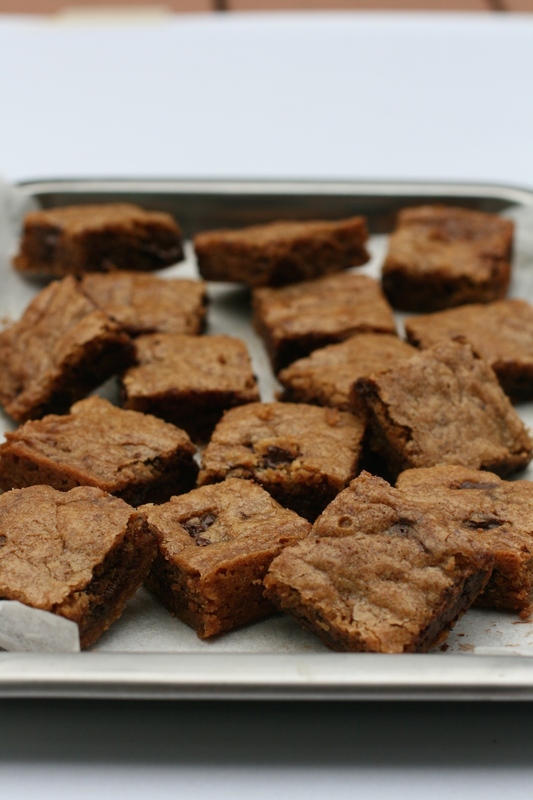 Playing with traditional flavours, blondies are a spin on the chocolate-heavy brownie, but still give a hint of chocolate in each bite with the hand-chopped chunks of chocolate. 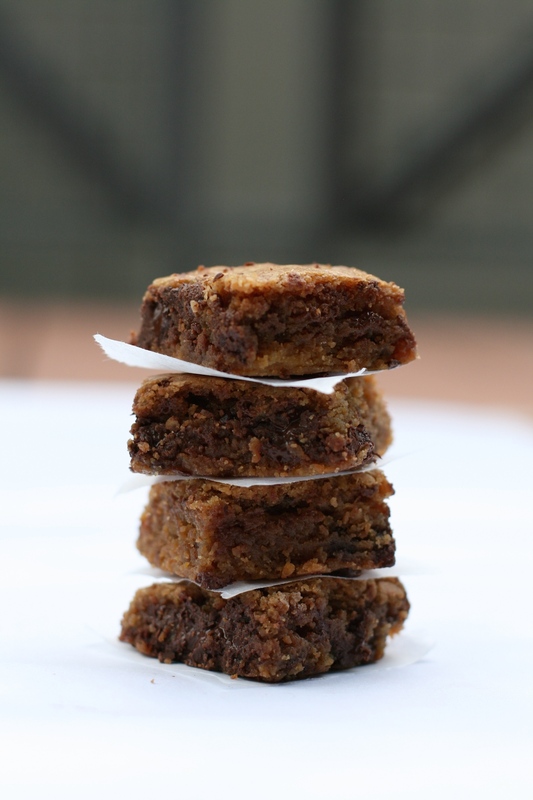 If you’re still contemplating whether to make these blondies, I urge to you try them. They’re simple but still quick and are definitely satisfying if you're craving a sweet treat. Preheat the oven to 350°F or 175°C. Position your rack in the middle of the oven. Grease or line an 8x8 inch (20x20 cm) square pan with non-stick cooking paper or parchment paper. Melt the butter in a saucepan with a light-coloured bottom. Continue heating and stirring the butter. When you start to see browned milk solids at the bottom of the pan, take the pan off the heat and pour the browned butter into a large bowl. Set the bowl aside and allow the butter to cool. In a medium to large bowl, combine the flour, baking soda and salt. Set the bowl aside. Once the browed butter has cooled down a little, add the brown sugar and mix until combined. Add the egg and vanilla into the bowl and stir to combine. Add the flour to the butter mixture and mix everything together. Halfway through mixing in the flour, add the chopped chocolate and any add-ins. Spread the mixture in your prepared pan. 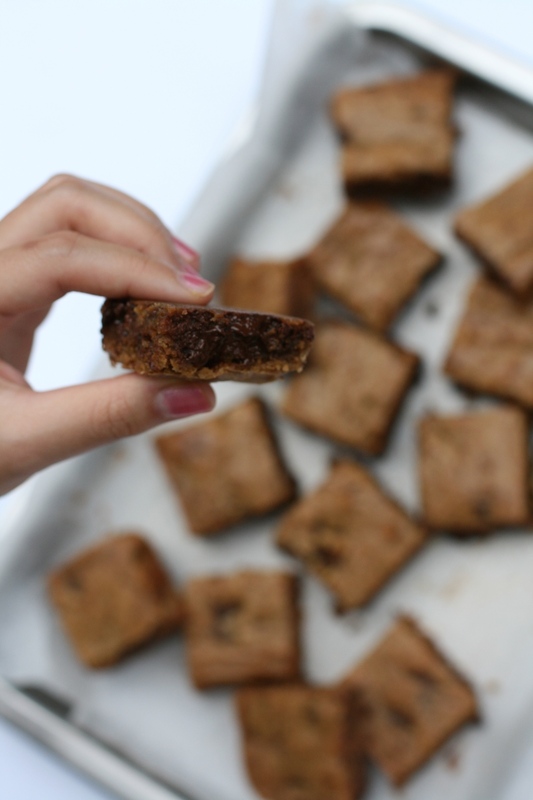 Bake the blondies for 16-18 minutes, depending on whether you like your bars chewy or crispy. Let the blondies cool in the pan for 10 minutes, and then take them out and slice them into 16 or 25 squares.